He tormented the Scots in the only 'League' clash with Wales. Q From Ger Harley: "I can vaguely remember Scottish League v English League matches plus ones against the Welsh and both Irish leagues. I think they finished around the late seventies. 3. did any non-Scots or non-English players ever play for either the Scottish or English sides"
Football League: Shilton (Stoke), Cherry (Leeds), Mills (Ipswich), Doyle (Man City), McFarland (Derby), Todd (Stoke), Wilkins (Chelsea), Channon (Southampton), Greenhoff (Stoke), Currie (Sheff Utd), Tueart (Man City). Fixture list pressure together with declining crowd interest (the attendance for this game was just 8,874 despite the presence of several star names in the English line-up) put paid to a series which had started back in 1892. The Scots won 5-2. Joe Harper scored twice with Davie Robb, Peter Cormack and Willie Johnston netting one apiece. There were only around 5,000 present. George Connelly scored the only goal in front of 7,654 spectators. There were also matches against the Southern League, Danish League and Italian League. In two matches against the Italians in the early 1960s the Scots not only faced the cream of Italian football but the Swedes Hamrin and Nielson, Helmut Haller of West Germany, the Brazilian Mario Zagalo, England's Gerry Hitchens, Welsh legend John Charles and our very own Denis Law! In his centenary history of the Scottish League 'The First 100 years', Bob Crampsey points out that in the first inter-League game at Bolton in 1892 there were four Scots in the Football League side. Crampsey says that after the first few games no more Scots would be selected until the 1960s. Dave Mackay played for the Football League against the Scottish League. Denis Law didn't just play FOR the Italian League, he also turned out for the Football League against the Italians in 1960 - a match which also saw German goalkeeper Bert Trautmann don the English colours! Indeed during the early 1960s Welsh stars like Cliff Jones and Jack Kelsey and Irishmen like Peter McParland turned out for the Football League. International rules were much stricter then, as Crampsey points out. Many players (and Crampsey cites Bob Ferrier of Motherwell and JB McAlpine of Queen's Park as examples) were able to play for the League but were ruled out of appearing for Scotland because they had been born in England. This was the rule which saw the Baker brothers - Joe and Gerry - play for England and the USA respectively, despite their cut-gravel Scottish accents! So there were plenty of non-English in the Football League sides but whether you could count the players who turned out for the Scottish League as 'non-Scots' is debatable. Especially as we live in an era which has awarded international caps to Matt Elliott. There were players of Canadian or South African extraction but again these were of Scottish parentage. Q Tom Fletcher e-mails from Canada: "Who was the last Scotland player to score a hat-trick and in what game?" A It was Colin Stein, who scored four in the 8-0 win over Cyprus in a World Cup qualifier at Hampden in 1969. Q Mike Burgess wants to know: "Who was the first £1 million Scottish player ? " A Andy Gray was transferred to Wolves from Aston Villa for a then British record fee of £1,469,000 on September 8th 1979. He actually didn't cost Wolves a great deal as they'd just sold Steve Daley to Man City for £1,437,500 three days previously. So, in effect Wolves signed Gray for just £31,500. Considering Villa had paid Dundee United just £100,000 for Gray four years previously, it was a smart piece of business all round. 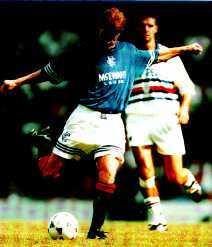 The first £1M transfer inside Scotland was in October 1987 when Rangers signed Richard Gough from Spurs. The fee has been quoted between £1.1M and £1.5M. Q DL McPherson asks: "Could you settle an argument please and tell me who were champions in 1977?" A Certainly. Celtic won the title in 1976-77, finishing eight points ahead of Rangers. It was the 10th (and last) title won by manager Jock Stein. A The SPL was set up at the start of the 1998-99 season. But the Premier Division was established back in 1975-76.